Is that your heart’s cry? That was mine when I looked at the mess my house had become over years of neglect. My house was so bad, I couldn’t even face it. That was the birth of Kamikaze Cleaning. But then I realized I would eventually have to deal with all the stuff I had squirreled away in boxes. It was time to get my house back. This book has everything you need to know to sort through all your stuff and make your home the way you want it. Take a look at the Table of Contents. Then this is the perfect book for you. It approaches the whole task of home organization and cleaning from a visual perspective. For example, it explains why you leave things out in the open instead of putting them away. Why housekeeping is such a chore for you when it seems so easy for others to do. Check out this excerpt of Chapter 2 and see if you can identify yourself. Approaching housekeeping from a right-brained perspective makes all the difference in the world! 2) Overwhelmed Mode: There are two versions of the overwhelmed mode. The first is the house where nothing is ever put away and things just pile up over time. Cleaning it properly is no longer possible because of all the stuff sitting around. In the second version of Overwhelmed Mode, there are only parts of the house that are not shown to visitors, such as closets, certain rooms, the basement, the bedrooms, and so on. The house always has that “lived in” look and that is what people expect when they come over. Solution: I Want My House Back! The third mode represents a right-brained person living with few distractions or little outside pressure. The second mode kicks in when things get a little tough in life and housecleaning goes by the wayside. Crisis mode occurs when something drastic happens and there is usually no time or energy to devote to anything except the very basic necessities in life. When this happens, the house eventually becomes its own crisis. This book is written for the overwhelmed mode of operation. You will need elements of both Kamikaze Cleaning and Right Brain Housekeeping, so I have included an explanation of the principles in each of those so you can use the ideas without having the books in hand. 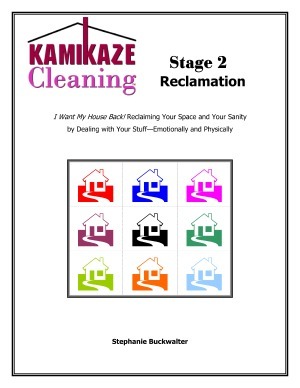 If your house is so overwhelming that you can’t imagine beginning to work on it, start with Kamikaze Cleaning. It is designed to be quick and easy, with no emotionally draining decision-making to slow down the process. That is why it can be done in less than a week. If you are ready to face your stuff, then dive in with I Want My House Back! How to Track Your Energy Expenses - A great ebook on all the new light bulb types and how to see if they are really saving you money. Home Sweet Home: Creating a Joyful Home Atmosphere – Practical help on sweetening the mood of your home from Cindy Carrier. Please note: This product is currently unavailable. If you are interested in knowing when it will be available again, please let me know through the contact form. Thank you.